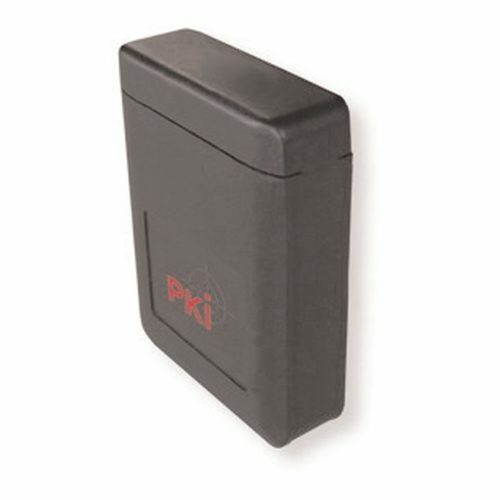 The PKI 1945 tracking tag is a mini GSM tracking transmitter for the detection of lost or stolen items. The PKI 1945 GSM module is combinedwith a remote controlled tracking transmitter and a loud audio signal generator. Its standard mode is the sleep mode, which is interrupted within adjustable intervals for the receipt of instructions via SMS. If it is activated by a specific SMS, it captures all information data from GPS and the surrounding GSM radio cells and transmits them to a server. This captured data allow the exact determination of its position depending on topographic conditions, with an accuracy of up to two meters. Once at the determined place, a control command can activate the integrated tracking transmitter. The transmitter emits a range of sounds in three graduated transmission powers. This allows further exact determination of its position. If the transmission signal is received without interruption, a directional antenna must be used. The exact frequency can be adjusted via SMS in order to avoid problems with busy frequencies. If the PKI 1945 still is untraceable, it is possible to activate the signal transmitter with a further control command, in order to obtain an acoustic signal, which allows locating of persons within crowds, for example. The sleep mode in combination with Lithium batteries provide an extremely long operating time. The module emits a message informing the user of low battery charge. As its tracking function is not only based on GPS it is possible to locate the PKI 1945 even under difficult conditions. The device uses the information of all GSM signals available on-site and thus is not affected by dead spots of single networks. Consequently it obtains a more accurate result than devices working with conventional GSM locating based on only one single network. Dimensions: 40x40x20 mm waterproof housing. On request also available in camouflage design.